The old chicken farmer has done it again—gotten the media all riled up over two Mustangs he will bring to the New York Auto Show. 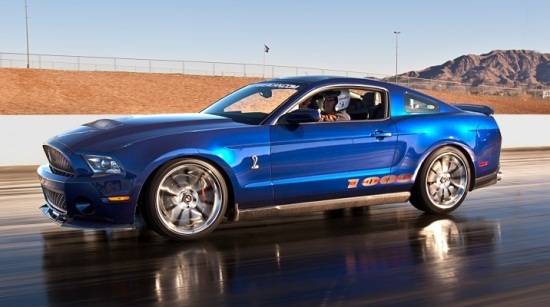 The street-version Shelby 1000 has 950 hp; the car for the track, 1,100 hp. Both are based on the 2012 GT500. I’m more interested in what the new Viper, also to be revealed in New York, will show us, but you can be sure the Shelbys will draw big crowds. The old 5.4-liter V8 gets rebuilt again—new crank, pistons, rods; the heads get “a flow job,” a fat supercharger is added—plus the car has a rebuilt suspension, bigger brakes, driveshaft and rear end. Muscle, baby, so you can smoke your tires at will. The Shelby 1000 street version starts at $149,995 plus the cost of the GT500; the 1,100-hp track S/C starts at $154,995, plus your donor GT500, so you’re looking at well over $200,000. The old guy with his patched-together body, a race driver, chili and deodorant merchandiser, litigator and maker of the greatest sports car hotrod of all time (the Cobra), has finally achieved his 1,000-hp goal for a car that simply doesn’t deserve it. As someone said somewhere in a comment, why didn’t Ford and Shelby put their resources into something like a resurrected Ford GT, which might have the potential to absorb that kind of power? Rich folks have a lot of money sitting on the sidelines right now, but who in their right mind would put over $200K into one of these things? The muscle-car horsepower race has gone beyond pointless. Not to mention the car’s looks: the interior looks cheap, and the exterior is all out of proportion. At age 89, even Carroll Shelby should know better than to do his swan song with a car like this. What a launch! Are you as tired of the muscle-car horsepower wars as I am? Tell me about it. This entry was posted in Car Industry News, Car Minded, Car Shows, Domestic Cars, Exotic Cars, General Chat, United States and tagged Ford Shelby 1000, Ford Shelby GT500, horsepower wars. Bookmark the permalink. I own a 2010 Shelby GT500 and @ 540hp it is quite fine for the purchase price of around $55k. This car shown here loses many of the visual features which made me want to buy my car (brand new even) in the first place. The additional horsepower would be nice but it’s at way too high of a cost. For $200k I would definitely foreign and buy the Lamborghini Gallardo or another supercar I have desired for some time. how sad that a true automotive pioneer has turned his products into parodies of themselves. Except they aren’t very funny, just pogey bait to rip off dumb rich people with no class.